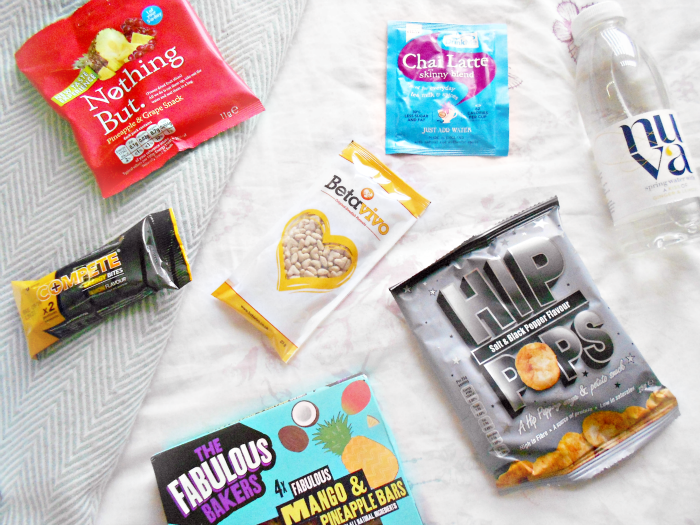 Since Christmas has been and gone now Degustabox subscription boxes are starting to get a lot healthier, filled with some delicious snacks to take on the go. This month's box is called 'Healthy New Year' which is ideal for those of us who are left feeling guilty after eating a lot of chocolate over Christmas. Koko Dairy Free Milk £1.79 - Koko milk is freshly made using coconut milk and contains fewer calories than skinned milk, but tastes just as remarkable as cows milk on breakfast cereals. I love the sound of this milk and I am pretty convinced my mam will too as she doesn't drink dairy milk. I can't wait to have this in a cup of tea or on my cereal and not feel guilty. Hip Pops 2x £1.00 - Hip Pops are a healthier snack when compared to similar fried or baked snack products, typically 50% less fat than your standard crisps. They come in 6 different flavours and are gluten-free too! I really enjoyed eating these as a light snack for dinner, they taste very flavoursome but good at the same time. You aren't left feeling starchy or unsatisfied like some crisps can do. Nothing But 2x £1.69 - Healthy freeze-dried fruit and vegetable snacks, under 80 calories and no added...anything! I already eat these as part of my workout routine as a little pre-workout snack if I am on the go. They are very satisfying, full of delicious flavours and quite filling too. Perfect to chuck in your bag as an on-the-go healthy snack. Betavivo 2x £1.00 - A crispy oat heart shaped cereal which is proven to lower your cholesterol and blood glucose. I just love how adorably shaped these are it just makes them look more appealing compared to your standard oats. They are very dry to eat even with milk I still found them too dry so I don't think I would purchase these from a supermarket. Nuva Water 2x £1.49 - In the flavours Ginger and Lemon and Cucumber and mint, these spring water bottles provide no sugar, sweeteners or preservatives. Encouraging people to hydrate in a healthier way. As much as I love cucumber and ginger I don't like the idea of them in a bottle of water. I have tried a cucumber smoothie before and really did not like it, so I think these may be given to someone else. But they are definitely a way to encourage people to drink more water! Fabulous Bakers £1.80 - These mango and pineapple baker bars are made purely out of natural, honest ingredients that contain no nasties! They are made with real fruit, slow release energy oats and they're high in fibre too. I love things like this so I can pop into my bag as an on-the-go snack! Complete Energy Bites £1.99 - Energy bites are delicious, low-calorie chocolate infused with caffeine. Energy bites provide an instant boost to help improve your alertness, endurance and physical energy. Recommended to take 5 minutes before physical exercise, driving, partying or studying. I have tried the mocha flavour of these bites before and ended up having to brush my teeth twice straight after, as they tasted too strong. Perhaps a lemon flavour might taste nicer. Drink Me Chai - Spiced with a hint of clove for that everyday guilt-free fix! Only 42 calories per cup. Chai latte is one of my favourite hot drinks ever, it is always the drink I go for in Costa or Starbucks. Very festive. I cannot wait to drink this! Barilla Vegetable Sauce £2.00 and Fusilli £1.50 - I always have things like this stocked in my cupboard for one of those I can't be bothered to cook evenings. These are great as they are nutritious and a lot healthier for you than some brands. Perfect for a quick whip up a meal. Crabbies Light Ginger Beer £1.49 - I think these drinks are perfect to give as gifts to someone you know who enjoys alcohol. I don't like ginger beer so this will be given away to someone who will enjoy it much more. Red Square Toffee Mini £1.99 - I have tried vanilla vodka before but never a toffee flavour and I am not sure how I feel about that. These little miniature sized bottles come in great use to mix together with other drinks. Overall I think this months Degustabox is another good one and perfect as the last box of the year. Filled with healthy treats which is perfect for us who have indulged in a lot of food over the festive period. I would really recommend people who enjoy food and are wanting to try new brands out to give this box a try. Who doesn't love the element of surprise especially with food?! It is like Christmas every month. You always come across some amazing brands and try some yummy recipes too! If you want to find out what other yummy treats Degustabox send out their website link is here, or you can find them on Twitter or Facebook for more information. Have you tried Degustabox out yet?? Reading this has tempted me to buy a Degustabox, it looks like you got a wide array of products. The Drink Me Chai is one I'm so curious to try! This is such a good idea. I've been tempted to trying these food boxes for a while. You got some amazing bits but I don't think I should buy any more subscription boxes this month haha! They are really good as you discover some new brands! It tasted lovely, I mean it's no Costa version but it is a close second! Oh my! I want off of this please. I genuinely can't choose a favourite.. they sound amazing. Aw I know, Chai Latte was my fav by far!